According to a Foreign Ministry release, the signing ceremony took place on Monday, April 8th in the Minister’s Conference Room on the 4th floor of the Ministry. 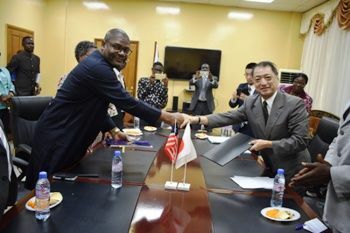 Liberia’s Foreign Minister Gbehzohngar Milton Findley signed on behalf of the Liberian Government while the Japanese Ambassador to Liberia, H.E. Tsutomu Himeno signed for the Japanese Government.